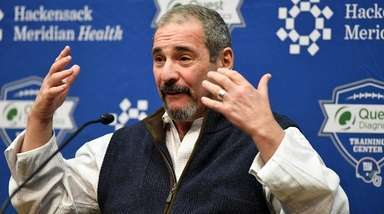 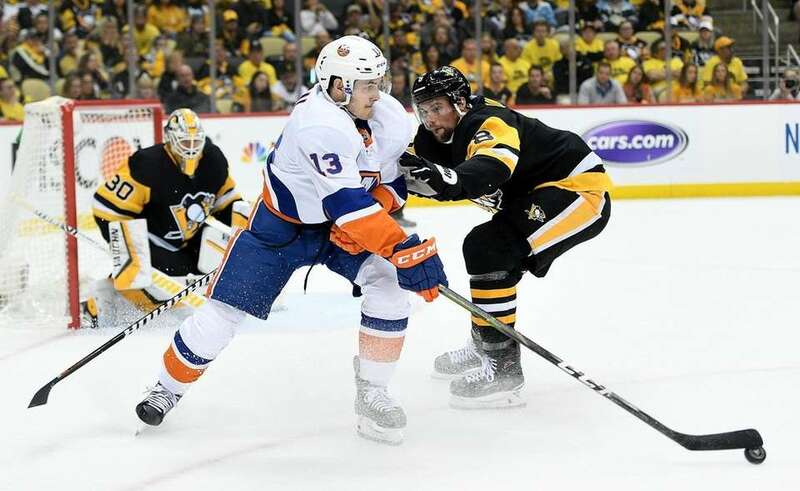 The Islanders beat the Pittsburgh Penguins, 3-1, in Game 4 of their Eastern Conference quarterfinal series on Tuesday, April 16, 2019, at PPG Paints Arena in Pittsburgh. 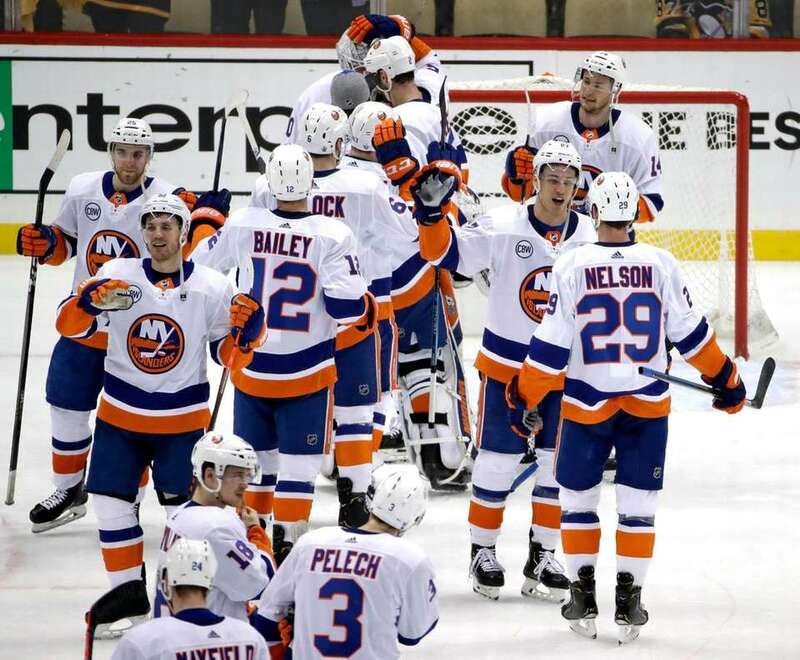 The win gave the Islanders a 4-0 series sweep, their first since the 1983 Stanley Cup Final. 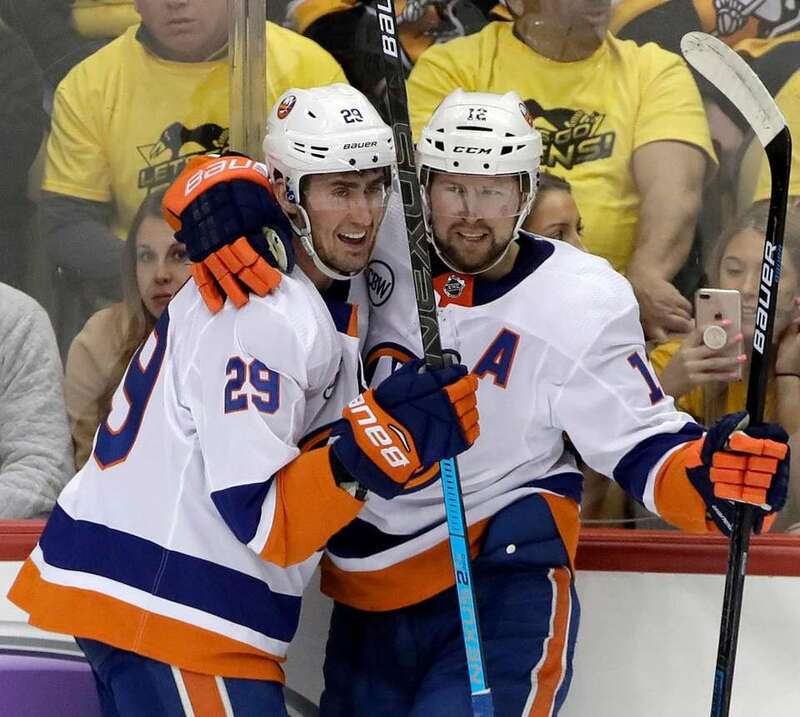 The Islanders' Brock Nelson celebrates his goal with Josh Bailey during the first period in Game 4 of an NHL first-round playoff series against the Penguins in Pittsburgh, Tuesday, April 16, 2019. 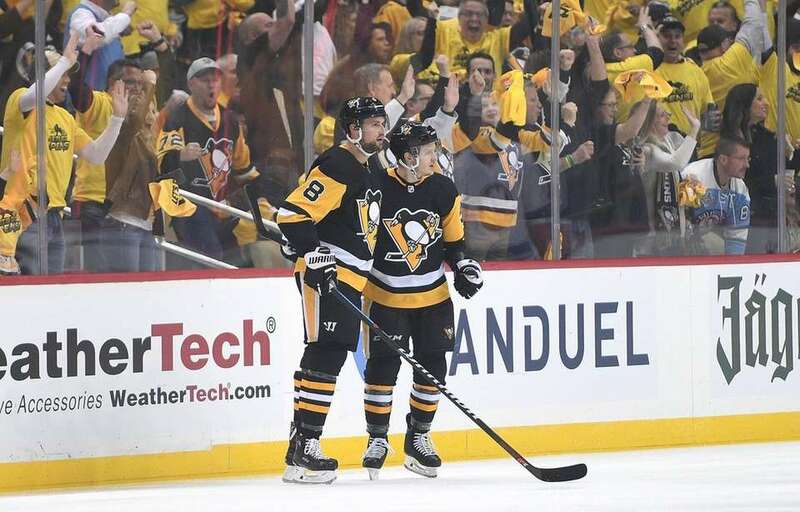 Jake Guentzel of the Penguins celebrates with Brian Dumoulin after scoring a goal during the first period in Game 4 of the Eastern Conference First Round against the Islanders at PPG PAINTS Arena on Tuesday, April 16, 2019 in Pittsburgh. 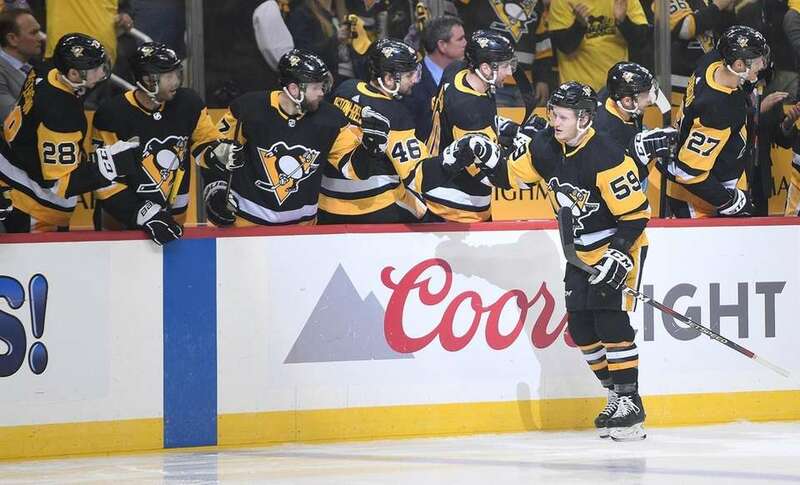 Jake Guentzel of the Penguins celebrates with teammates on the bench after scoring a goal during the first period in Game 4 of the Eastern Conference First Round against the Islanders at PPG PAINTS Arena on Tuesday, April 16, 2019 in Pittsburgh. 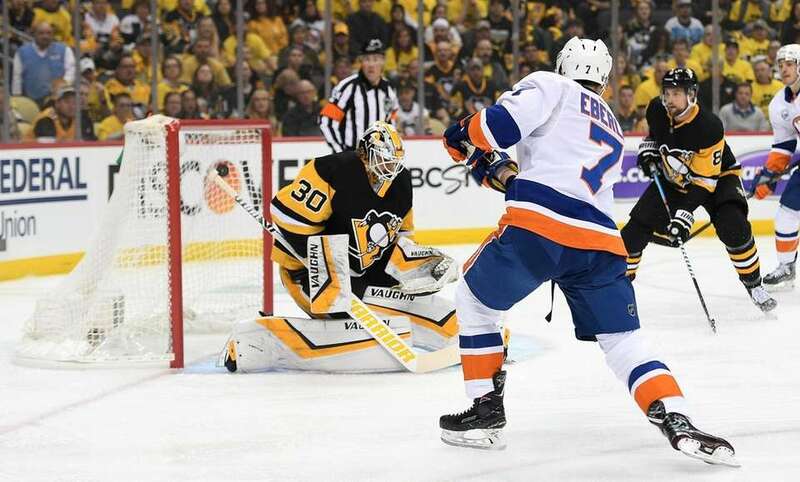 Jordan Eberle of the Islanders scores a goal past Matt Murray of the Pittsburgh Penguins during the first period in Game 4 of the Eastern Conference First Round at PPG PAINTS Arena on Tuesday, April 16, 2019 in Pittsburgh. 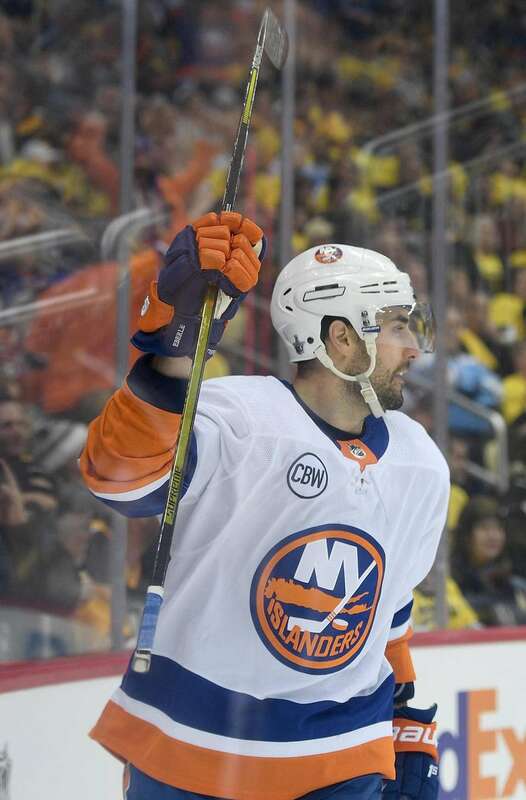 Jordan Eberle of the Islanders celebrates after scoring a goal during the first period in Game 4 of the Eastern Conference First Round against the Penguins at PPG PAINTS Arena on Tuesday, April 16, 2019 in Pittsburgh. 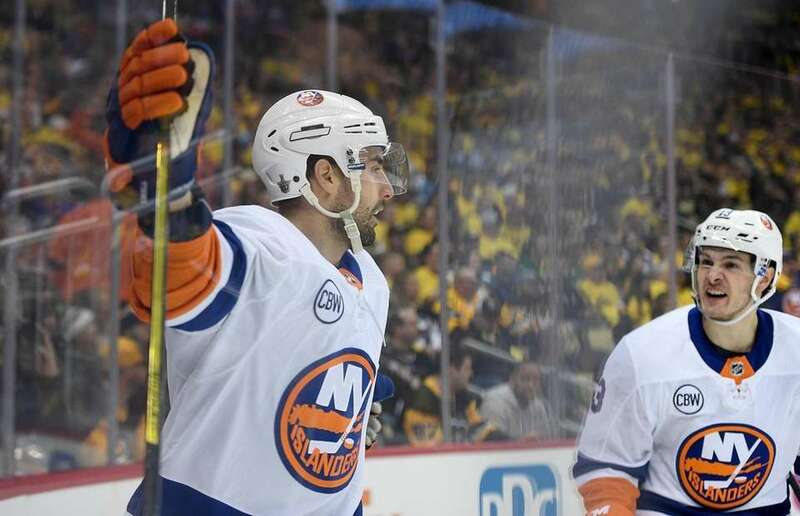 Jordan Eberle of the Islanders celebrates with Mathew Barzal after scoring a goal during the first period in Game 4 of the Eastern Conference First Round against the Penguins at PPG PAINTS Arena on Tuesday, April 16, 2019 in Pittsburgh. 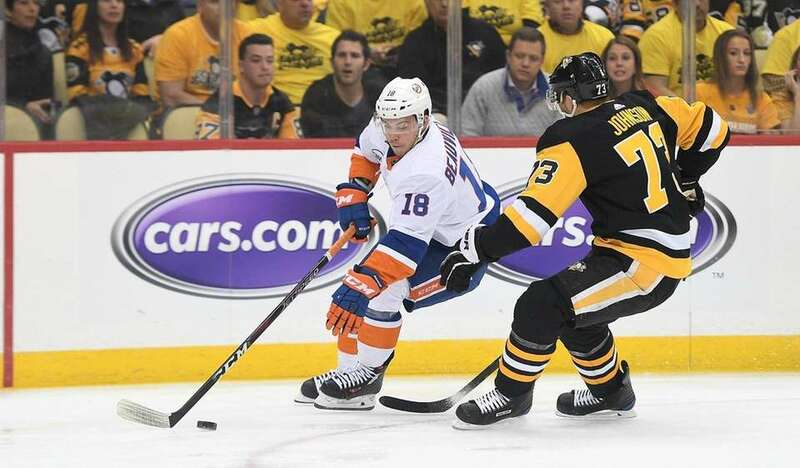 Anthony Beauvillier of the Islanders skates with the puck against Jack Johnson of the Penguins during the first period in Game 4 of the Eastern Conference First Round at PPG PAINTS Arena on Tuesday, April 16, 2019 in Pittsburgh. 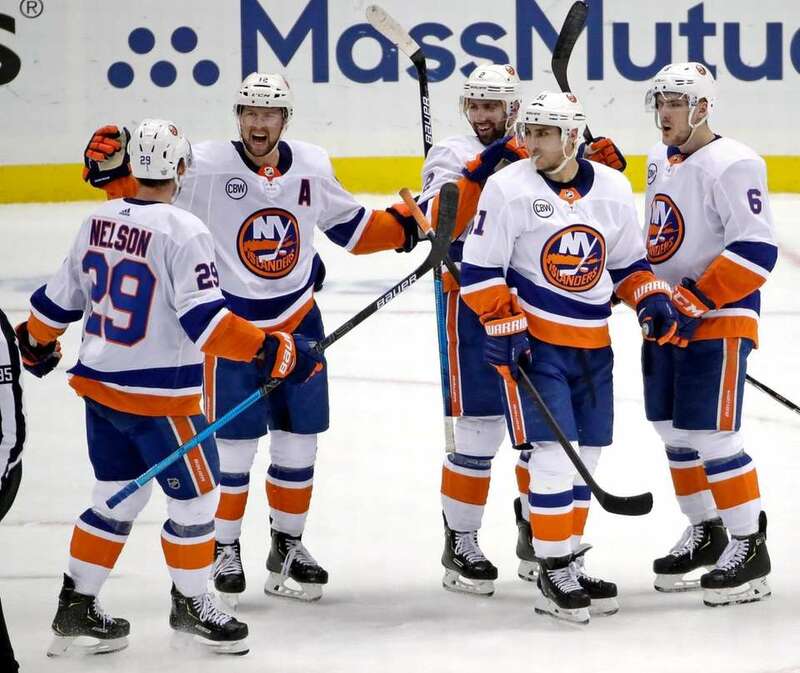 Brock Nelson of the Islanders celebrates with teammates after scoring a goal during the first period in Game 4 of the Eastern Conference First Round against the Penguins at PPG PAINTS Arena on Tuesday, April 16, 2019 in Pittsburgh. 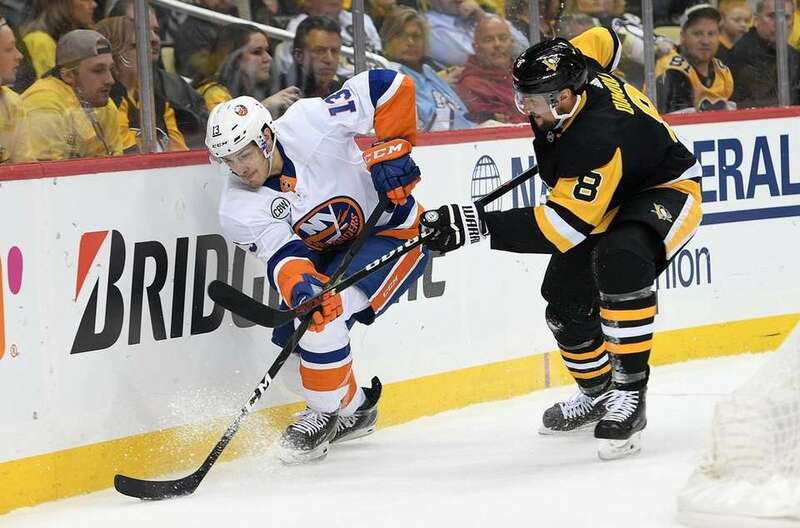 Mathew Barzal of the Islanders battles along the boards with Brian Dumoulin of the Pittsburgh Penguins during the first period in Game 4 of the Eastern Conference First Round at PPG PAINTS Arena on Tuesday, April 16, 2019 in Pittsburgh. 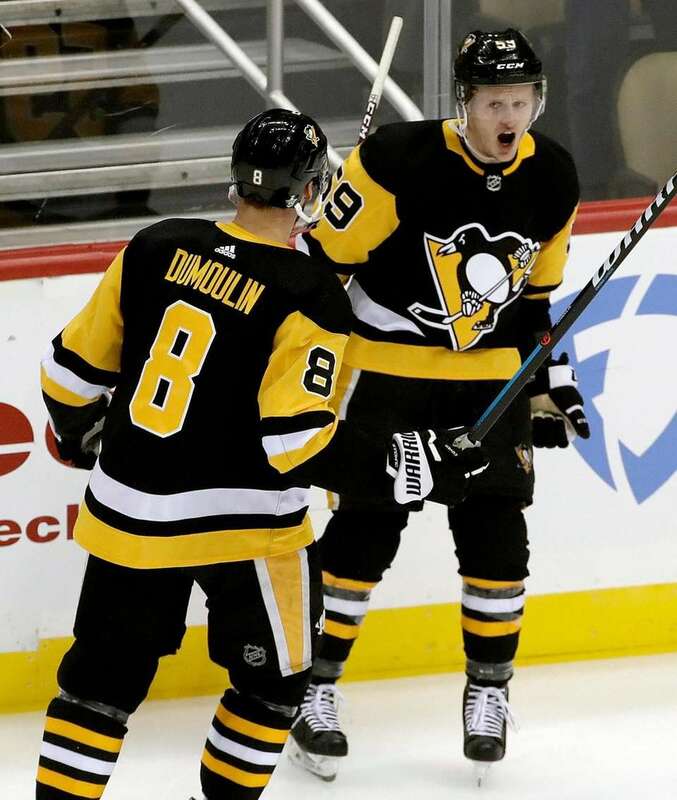 The Penguins' Jake Guentzel celebrates his goal with Brian Dumoulin during the first period in Game 4 of the Eastern Conference First Round against the Islanders at PPG PAINTS Arena on Tuesday, April 16, 2019 in Pittsburgh. 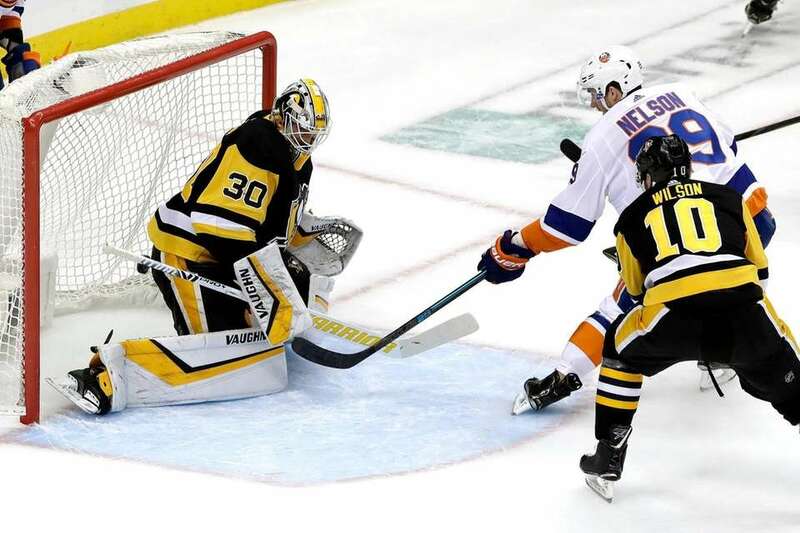 The Islanders' Brock Nelson puts a shot behind Penguins goaltender Matt Murray with Garrett Wilson defending during the first period in Game 4 of the Eastern Conference First Round at PPG PAINTS Arena on Tuesday, April 16, 2019 in Pittsburgh. 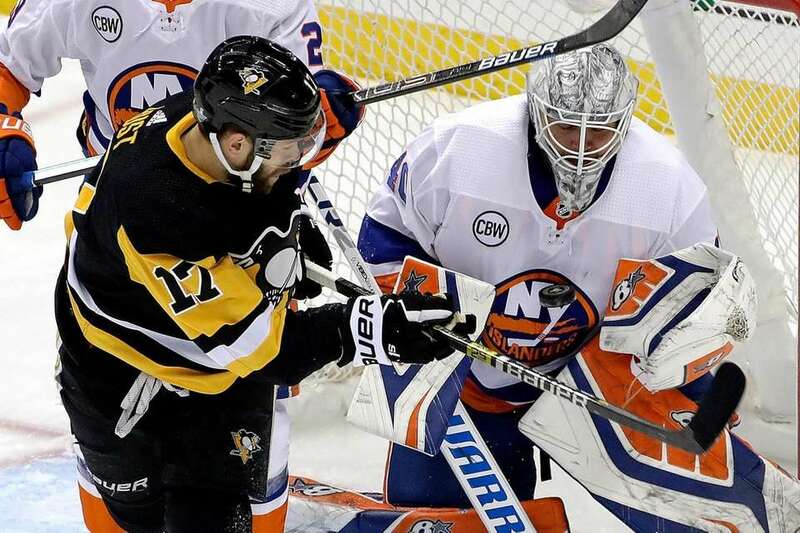 The Penguins' Bryan Rust can't get to a rebound off Islanders goaltender Robin Lehner during the first period in Game 4 of the Eastern Conference First Round at PPG PAINTS Arena on Tuesday, April 16, 2019 in Pittsburgh. 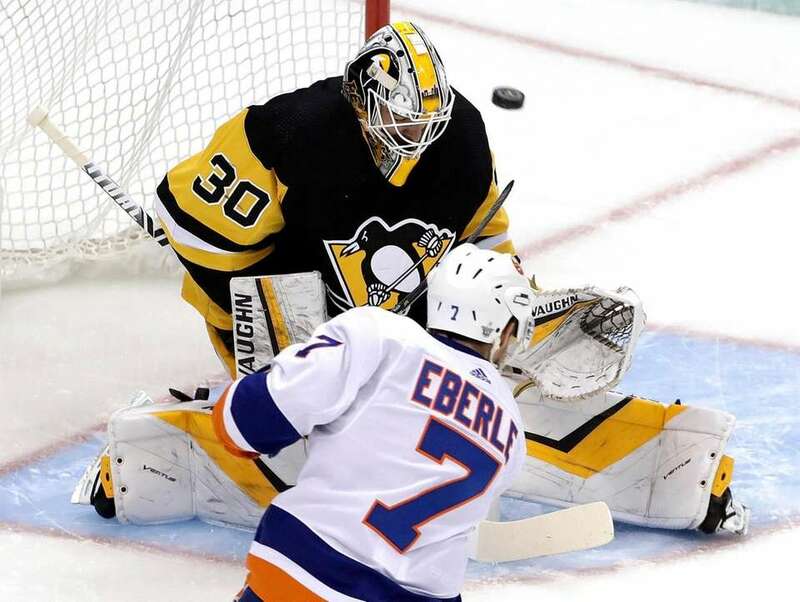 The Islanders' Jordan Eberle puts a shot past Penguins goaltender Matt Murray for a goal during the first period in Game 4 of the Eastern Conference First Round at PPG PAINTS Arena on Tuesday, April 16, 2019 in Pittsburgh. 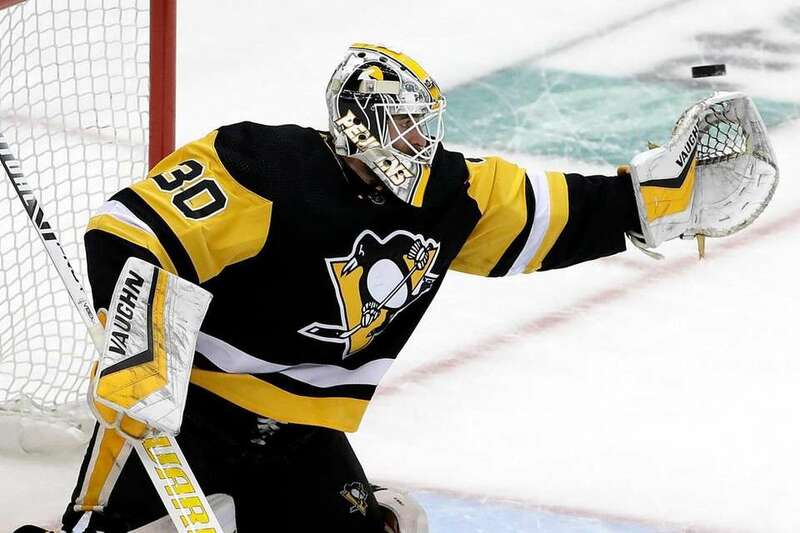 Penguins goaltender Matt Murray reaches for a shot during the first period in Game 4 of the Eastern Conference First Round against the Islanders at PPG PAINTS Arena on Tuesday, April 16, 2019 in Pittsburgh. 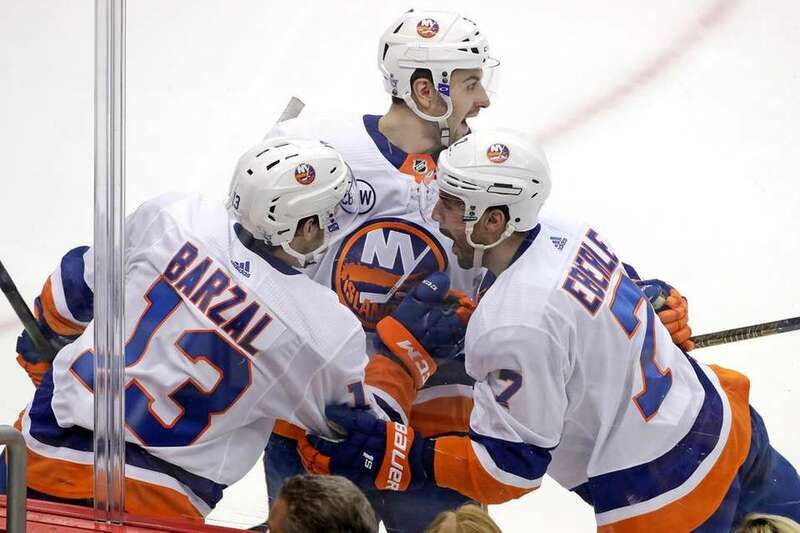 The Islanders' Jordan Eberle celebrates with Adam Pelech, center, and Mathew Barzal after scoring against the Penguins during the first period in Game 4 of the Eastern Conference First Round at PPG PAINTS Arena on Tuesday, April 16, 2019 in Pittsburgh. 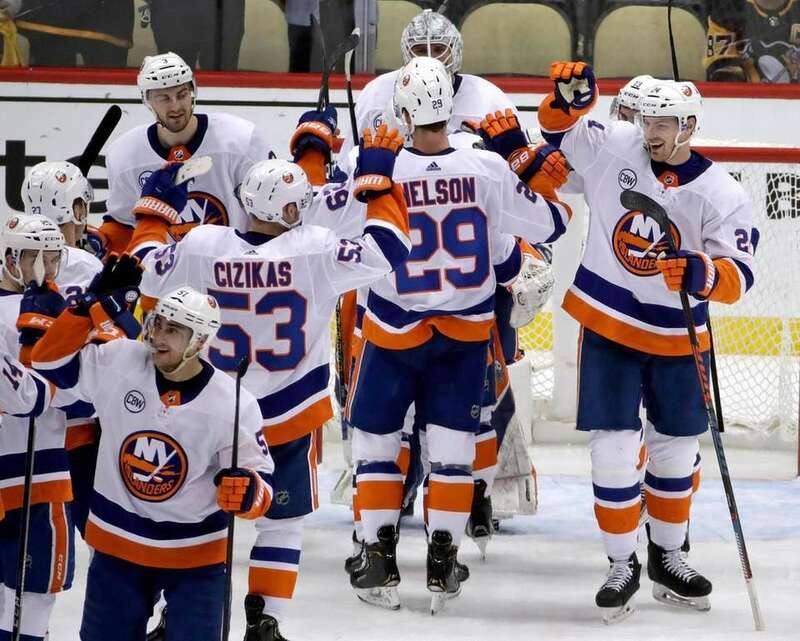 The Islanders celebrate at the end of Game 4 of an NHL first-round playoff series against the Penguins in Pittsburgh, Tuesday, April 16, 2019. 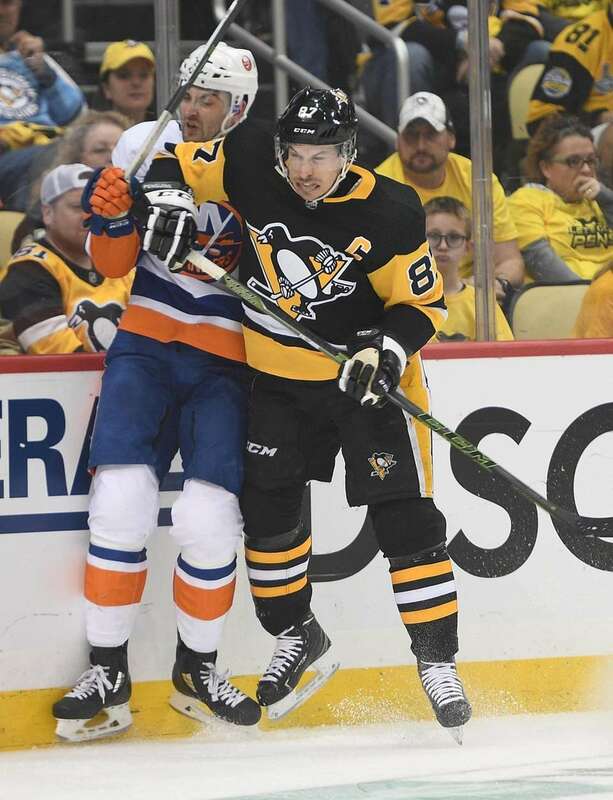 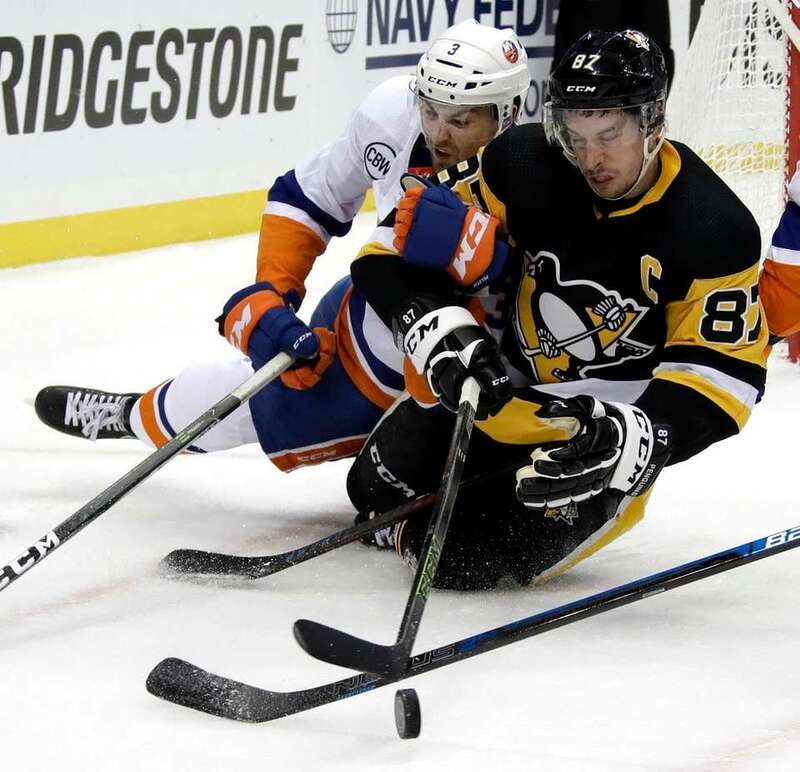 The Penguins' Sidney Crosby and the Islanders' Adam Pelech collide during the second period in Game 4 of an NHL first-round hockey series in Pittsburgh, Tuesday, April 16, 2019. 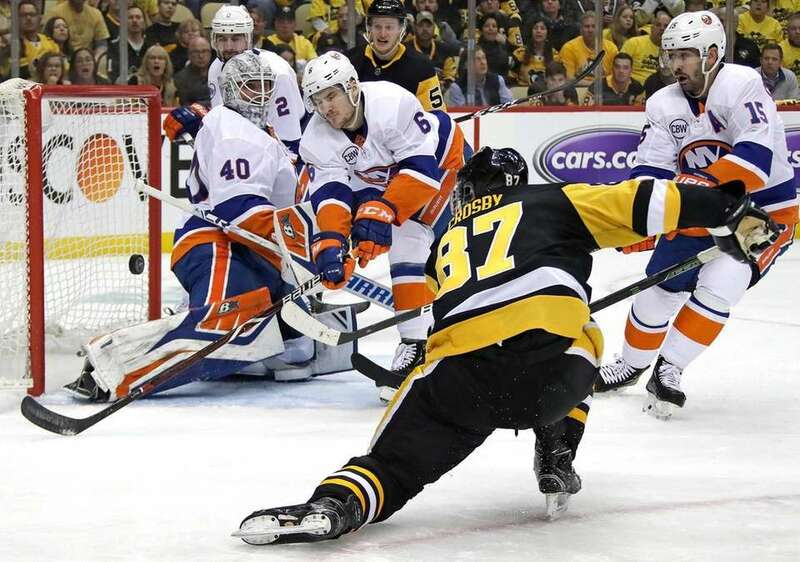 The Penguins' Sidney Crosby can't get a shot past Islanders goaltender Robin Lehner with Ryan Pulock defending during the second period in Game 4 of an NHL first-round playoff series in Pittsburgh, Tuesday, April 16, 2019. 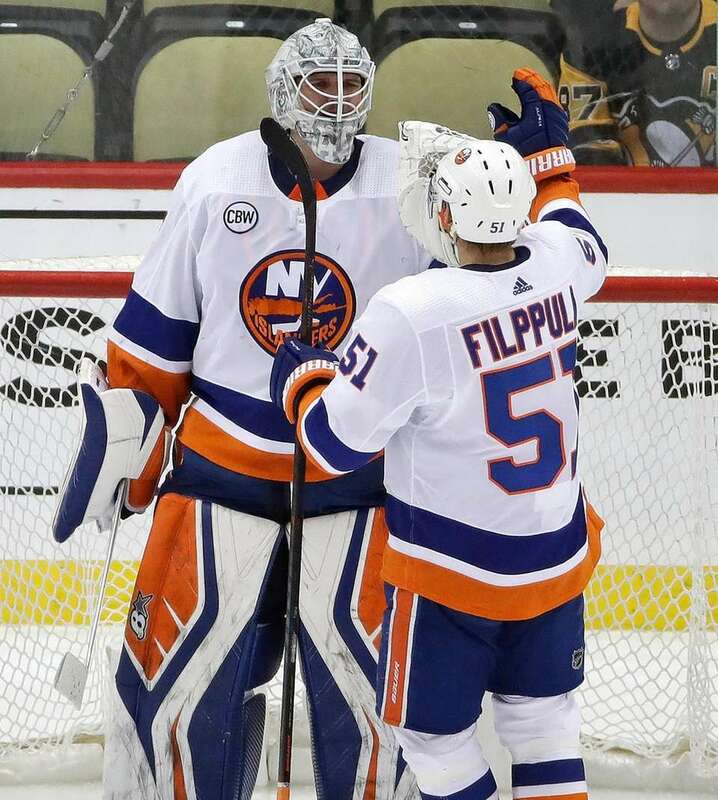 Islanders goaltender Robin Lehner celebrates with Valtteri Filppula at the end of Game 4 of the team's NHL first-round playoff series against the Penguins in Pittsburgh, Tuesday, April 16, 2019. 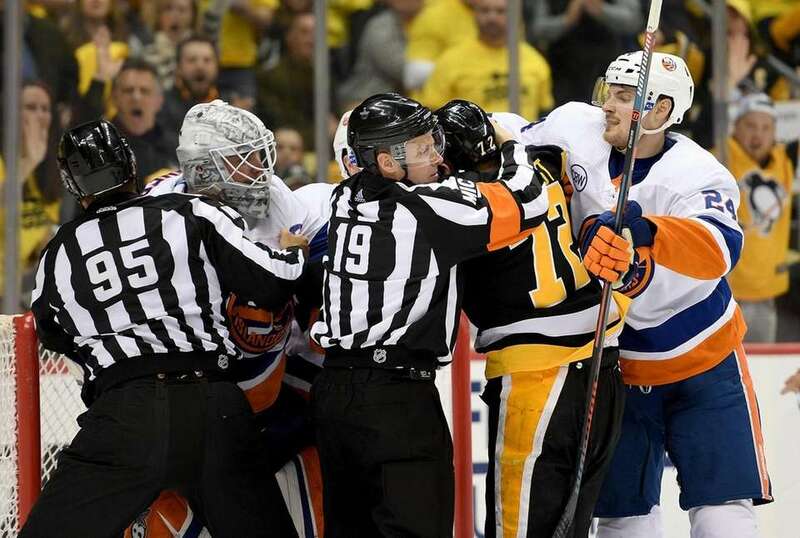 The Penguins' Patric Hornqvist is separated from Islanders goaltender Robin Lehner by officials, including linesman Jonny Murray, during the second period in Game 4 of an NHL first-round playoff series in Pittsburgh, Tuesday, April 16, 2019. 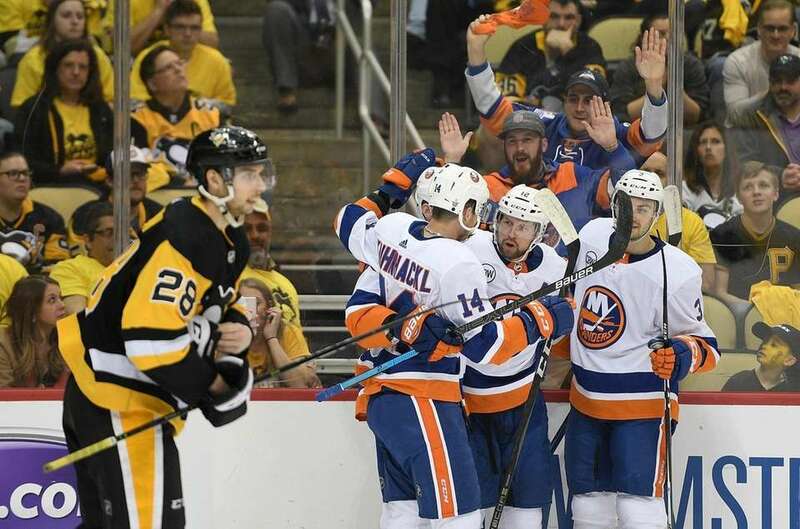 The Islanders' Josh Bailey celebrates his empty-net goal against the Penguins during the third period in Game 4 of an NHL first-round playoff series in Pittsburgh, Tuesday, April 16, 2019. 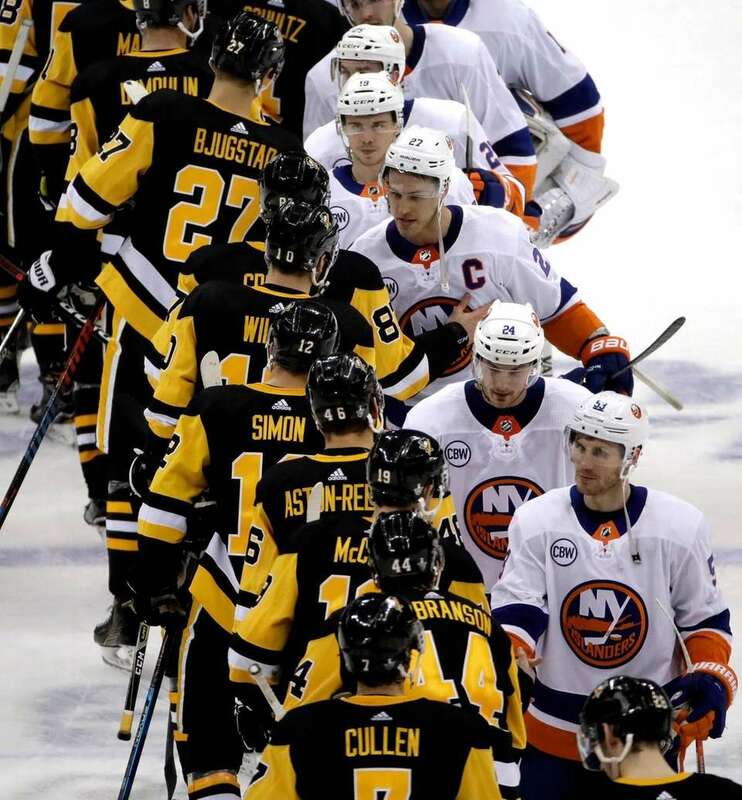 The Islanders, right, and the Penguins shake hands after Game 4 of an NHL first-round playoff series in Pittsburgh, Tuesday, April 16, 2019. 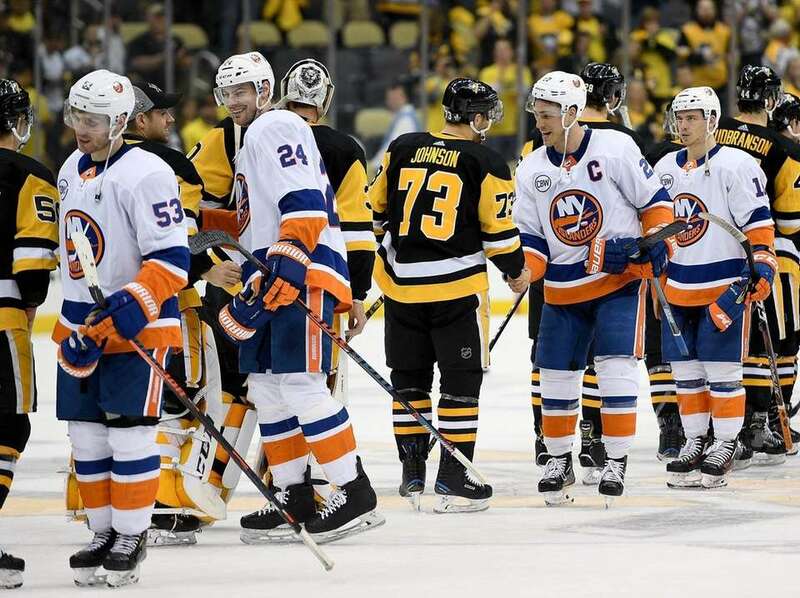 Anders Lee of the Islanders shakes hands with Jack Johnson of the Pittsburgh Penguins at the conclusion of the Islanders' 3-1 win over the Penguins in Game 4 of the Eastern Conference First Round at PPG PAINTS Arena on Tuesday, April 16, 2019 in Pittsburgh. 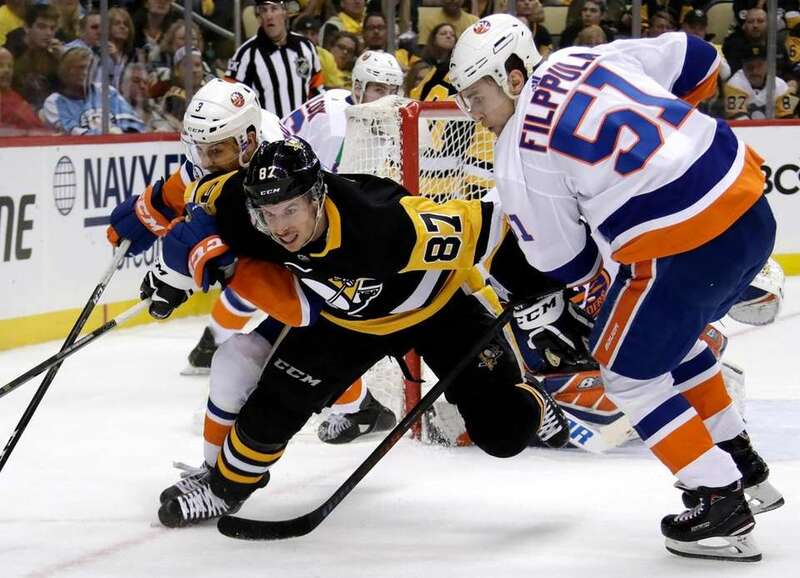 The Penguins' Sidney Crosby is defended by the Islanders' Adam Pelech and Valtteri Filppula during the second period in Game 4 of an NHL first-round playoff series in Pittsburgh, Tuesday, April 16, 2019. 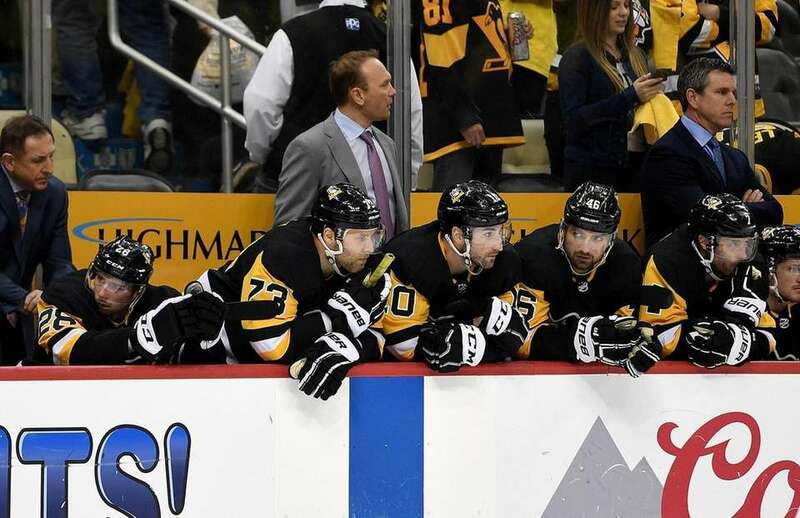 Members of the Penguins look on from the bench in the final seconds of the third period in Game 4 of the Eastern Conference First Round against the Islanders at PPG PAINTS Arena on Tuesday, April 16, 2019 in Pittsburgh. 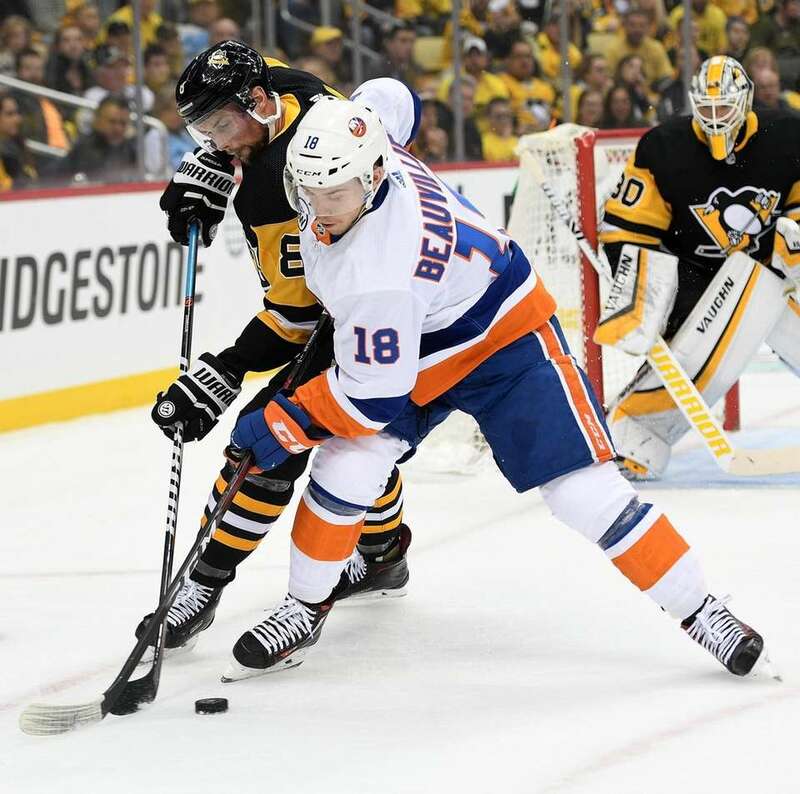 Mathew Barzal of the New York Islanders controls the puck against Brian Dumoulin of the Penguins during the third period in Game 4 of the Eastern Conference First Round at PPG PAINTS Arena on Tuesday, April 16, 2019 in Pittsburgh. 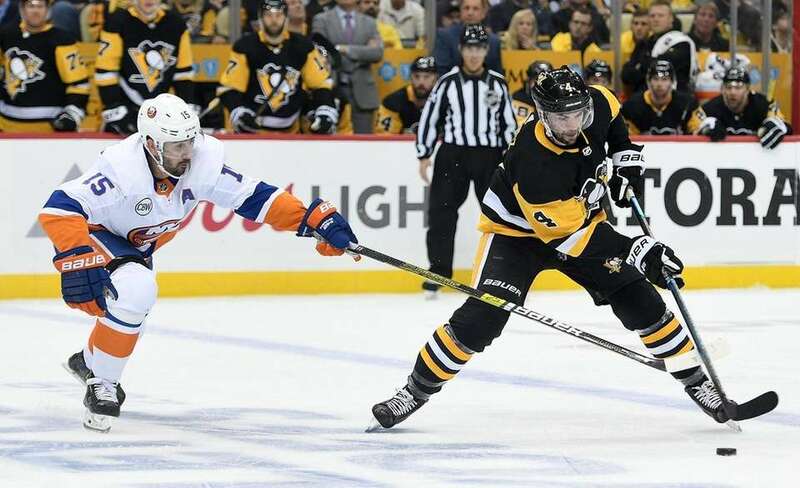 Scott Mayfield of the Islanders dumps the puck in past Bryan Rust of the Penguins during the third period in Game 4 of the Eastern Conference First Round at PPG PAINTS Arena on Tuesday, April 16, 2019 in Pittsburgh. 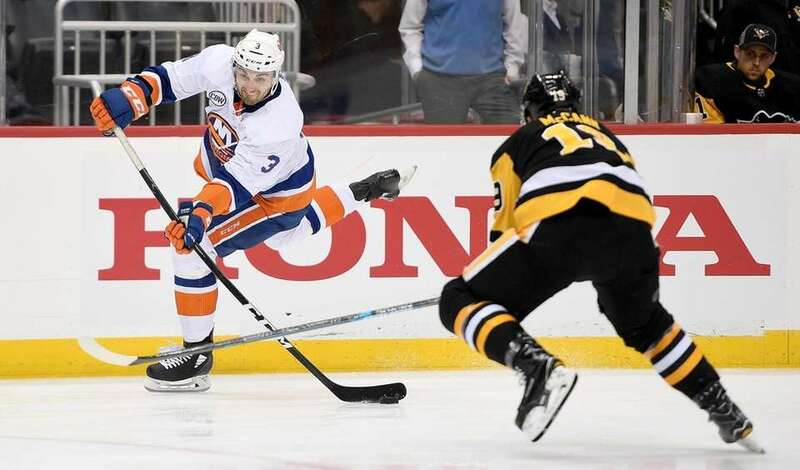 Adam Pelech of the Islanders attempts a shot as Jared McCann of the Penguins defends during the third period in Game 4 of the Eastern Conference First Round at PPG PAINTS Arena on Tuesday, April 16, 2019 in Pittsburgh. 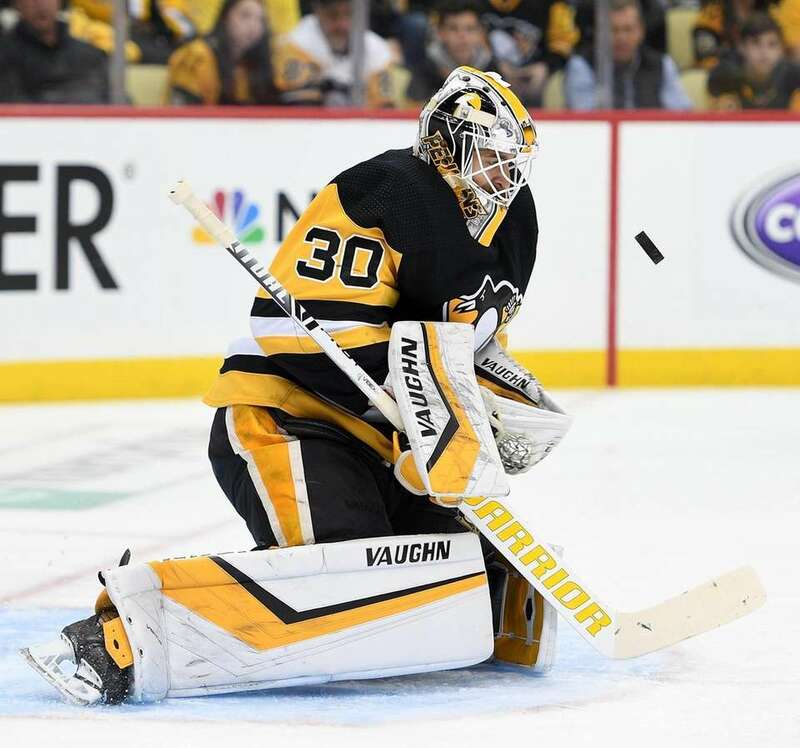 Matt Murray of the Penguins makes a save during the third period in Game 4 of the Eastern Conference First Round against the Islanders at PPG PAINTS Arena on Tuesday, April 16, 2019 in Pittsburgh. 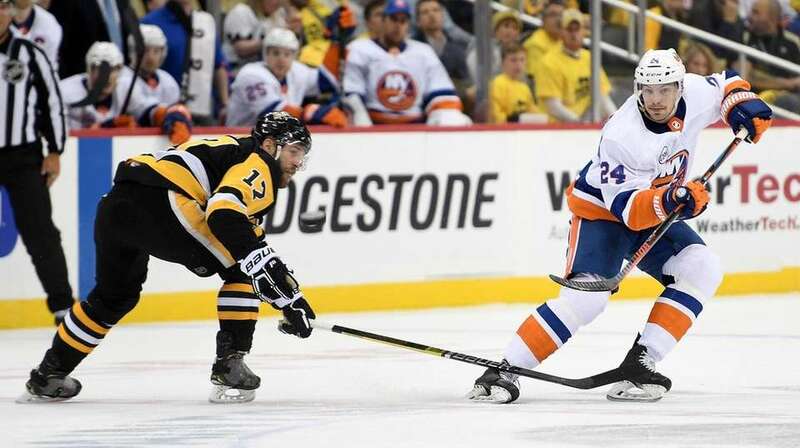 Justin Schultz of the Penguins controls the puck as Cal Clutterbuck of the Islanders defends during the second period in Game 4 of the Eastern Conference First Round at PPG PAINTS Arena on Tuesday, April 16, 2019 in Pittsburgh. 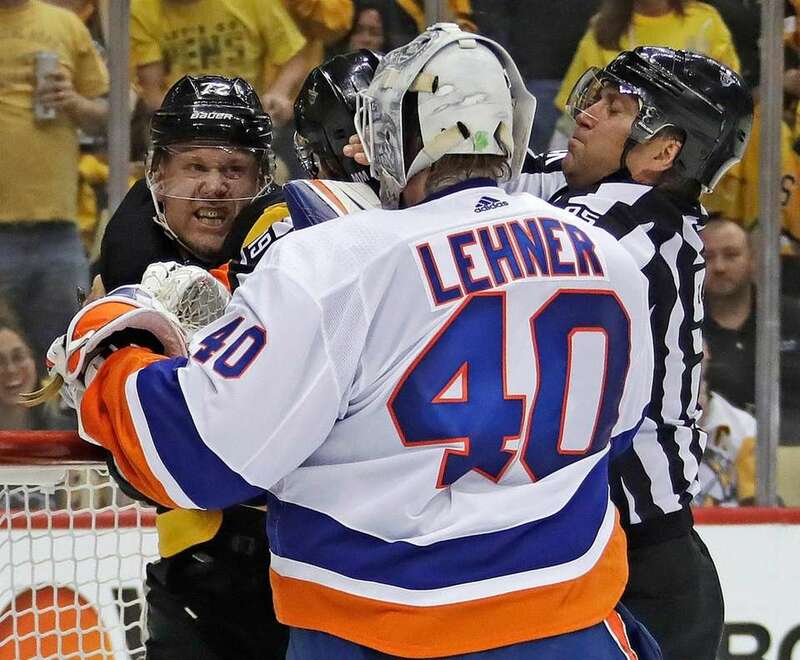 Robin Lehner of the Islanders exchanges punches with Patric Hornqvist of the Penguins during the second period in Game 4 of the Eastern Conference First Round at PPG PAINTS Arena on Tuesday, April 16, 2019 in Pittsburgh. 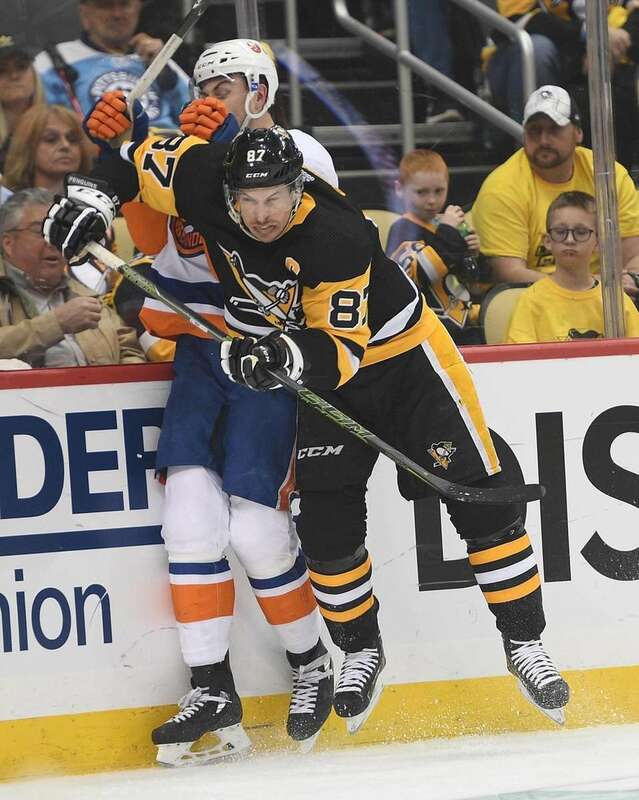 Sidney Crosby of the Pittsburgh Penguins checks Adam Pelech of the Islanders into the boards during the second period in Game 4 of the Eastern Conference First Round at PPG PAINTS Arena on Tuesday, April 16, 2019 in Pittsburgh.